Crude Oil’s slide from the October 2018 highs into a bear market has had absolutely no negative impact on the big Oil companies as one would expect. As earning season is upon us it was not expected by analysts that the three major Oil companies Shell, ExxonMobil and Chevron would beat expectations. The three major Oil companies posted Q4 earning as well as exceeding market analysts’ expectations with some earnings at its highest level since 2014. Which just goes to show that these Oil companies have learned how to raise profits when the price of Oil is well below $100/ barrel. Saudi Arabia and some Organization of the Petroleum Exporting Countries (OPEC) members formed a coalition with Russia, the world third largest oil producer and is now seeking a permanent agreement for three more years. The coalition was formed back in 2016 in a bid to stop the downward spiral of the Oil price by cutting output. Russia has pushed back on the idea as it is better positioned to balance its budget at current levels than Saudi Arabia, which needs Brent prices at about $73 a barrel to break even according to the International Monetary Fund. Brent Crude Oil has been consolidating sideways since the start of January 2019 and is waiting on fundamental direction. The price action has broken out of the descending channel and has formed a Inverse Head & Shoulders (H&S) Technical pattern. I am currently waiting on the fundamentals (OPEC, Russia) news to give some direction and to support the pattern playing out. We need to see the price action move higher and preferably close above the $64/ barrel level which coincides with the 38.2 Fibonacci Retracement level. 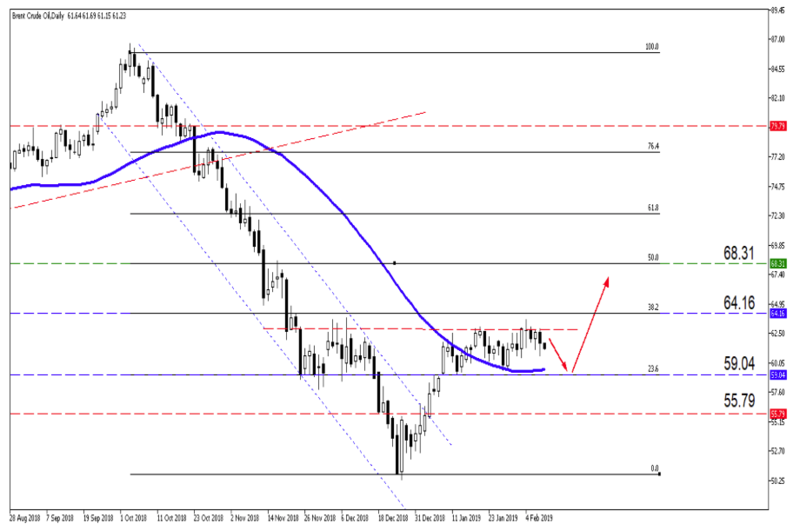 Our target price would be the $68/barrel as a first target price which is firmly halfway at the 50% Fibonacci Retracement. If the 23.6 Fib level which acts as support does not hold, then we might see the price action move lower to $55.79/ barrel. Then the H&S Technical pattern would be negated and no longer relevant. Currently the 50-day Simple Moving Average (Blue line) is still supporting the price action to move higher.